Thousands of people took part in the demonstrations during the general strike in Athens with clashes and arrests following. September 26th saw the first general strike in Greece since the elections of May and June. Thousands of workers joined the 24 hour strike and protests were held in cities and towns across Greece. The strike came as the government debates the exact details of the latest round of austerity measures. The measures will be finalised and put to parliament soon. After several months without any large scale demonstrations this was seen as a gauge of popular anger and a test for the new government. September has seen strike action taken across a number of services including transport, media, schools and municipality. 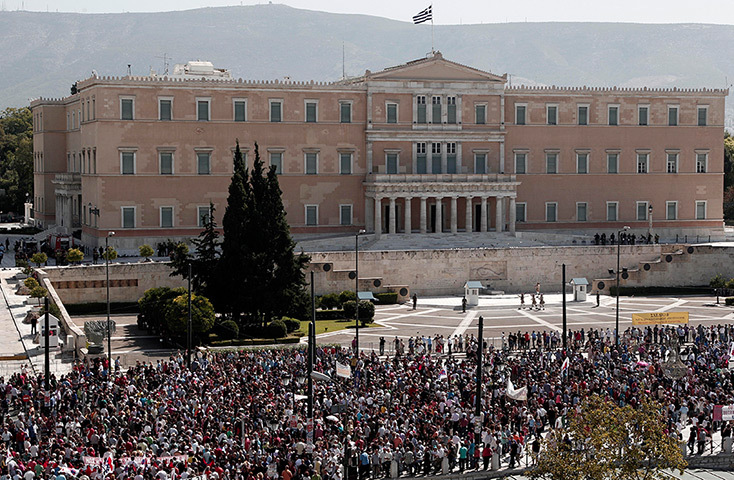 The general strike saw large parts of the centre of Athens closed down as thousands took to the streets to protest. It's difficult to know the exact numbers involved in the demonstration but somewhere in the order of 100,000 is likely. This would mean the demonstration was one of the biggest which has accompanied a general strike. There have of course been many such general strikes of 24 or 48 hours in Greece over the last few years. As for the demonstration itself it was covered by heavy police pressure from the start. Before the demonstration began several people were detained as they were preparing to join the demonstrations. In particular members of the various neighbourhood assemblies which operate around Athens were targeted. A water cannon was present for the first time and around 3,000 police were deployed. The demonstration progressed along the main streets of Athens' centre towards the parliament at Syntagma Sq. As the last blocs of protesters reached Syndagma police used tear gas and repeated charges to clear the area. The pressure was then kept up with repeated attacks along the main streets leading out of Syntagma Sq as rocks and molotov cocktails were thrown in response. As the crowd started to scatter the police motorcycle units (Delta) attacked and dispersed the remaining protesters. This followed a fairly familiar pattern to other large demonstrations. The difference this time was the speed with which the demonstration was broken up. This gave the demonstration the feel of a simple march from one point to another. Clashes later followed in the Exarchia area of Athens with more arrests reported. A further demonstration was held outside the police headquarters in solidarity with those arrested throughout the day and in particular those arrested before the demonstrations began.